Dr. R. Cordes, Department of Human Geography, University of G�ttingen, Federal Republic of Germany. 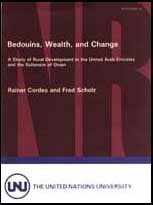 Special subjects: Social and Economic Geography of Developing Countries, Middle East (United Arab Emirates). Prof. Dr. F. Scholz, Department of Human Geography, University of G�ttingen, Federal Republic of Germany. Special subjects: Social and Economic Geography of the Middle East (Sultanate of Oman, United Arab Emirates, Kuwait, Pakistan) and Developing Countries. The use of the word "tribe" throughout this publication is intended to refer to a distinction between groups of differing social and political organization within an overall population having a common ethnic, cultural, and religious background and in no way implies any judgement of superiority or inferiority of social, political, ethnic, cultural, or religious systems.